Each TouchKeys sensor contains over two dozen conductive pads on the surface, covered by a white or black insulating layer. Each of the pads acts like a small capacitor (a circuit element that stores an electric charge). The pads are laid out so that when the finger touches the key, several pads increase in capacitance. A chip on the bottom of the sensor reads the capacitance of all the pads and arrives at a precise estimate of the contact location, with a precision of better than 0.1mm! 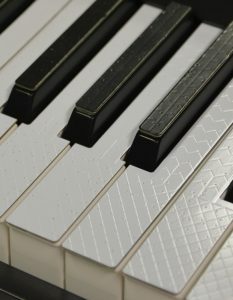 The TouchKeys sensors measure touch position in both axes: the X-axis, which runs from bass to treble on the keyboard, and the Y-axis, which runs along the length of the key. (The narrow part at the back of the white keys measures Y-axis only.) The sensors can measure up to 3 touches at a time, and they can also measure the contact area of the touch, which can be used to distinguish between the fingertip and the pad of the finger. Once each sensor has calculated its touch information, it passes the data to a controller board installed inside the keyboard (one controller for every 2 octaves of keys). The controller boards collect the data and send it to the computer by USB. The MIDI keyboard on which the TouchKeys are installed also attaches to the computer. 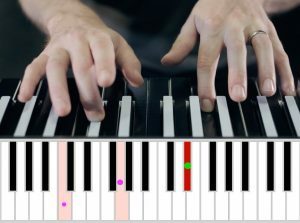 The TouchKeys software integrates the touch data with the MIDI from the keyboard to produce a detailed, precise picture of the performer’s motion on the keyboard. TouchKeys is based on research by Andrew McPherson in the Centre for Digital Music at Queen Mary University of London. You can find more information about the technology behind TouchKeys, including links to research papers, on Andrew’s research website.